The Abbotsford library has a new display from its Special Collections: The Way to a Man’s Heart….Settler communities and gender roles as reflected in 1950s cookbooks. 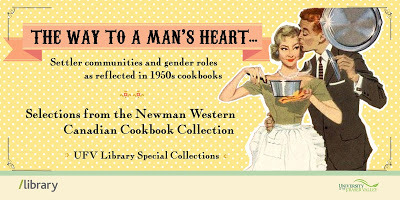 Come and see selected titles from the Newman Western Canadian Cookbook collection. Societal norms in the post World War II era saw proscriptive expectations for middle class women, and these are reflected in the cookbooks on display.